It’s the mid 90’s and thirteen year old Stevie (Sunny Suljic) and his older brother Ian (Lucas Hedges) are the children of Dabney (Katherine Waterson), a single mother doing her best to raise her boys in Los Angeles. Absent of a father figure Stevie falls in with a rough crowd of skaters (Na-kel Smith, Olan Prenatt, Gio Galicia, and Ryder McLaughlin), bonding over skateboards, booze, girls, and general miscreant behavior; navigating his young adulthood is likely to be messy. Written and Directed by Jonah Hill and shot in a stylized 4:3 frame (just like TV was in the 90s) this snapshot of a period sets the pace, time, and place but fails in its creation of a traditional story arc; rather it’s Hill’s prerogative to create a more esoteric arc, a series of smaller lessons, exploring the learning of who or what is really important during the formative years, to that end the film is interesting but may come across as a bit challenging for those looking for more of a traditional “story.” The real gems of this picture are those in the ensemble, well played all. Thumbs up to the sound design as well, the louder the punches, the meatier it gets. And, bonus to Hill, only one gratuitous shot including neon super soakers to establish time was used in the making of this film. 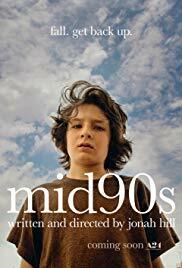 Mid90s is rated R.